Conveying of containers requires a wide variety of can and bottle conveyors to ensure optimum efficiency and avoid fallen containers and label damage where applicable. Drip trays are available with sockets to take slat lubricant away to the nearest suitable drain. 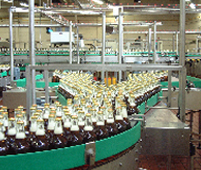 Slat lubrication systems can be fitted at extra cost. Complete control systems with track switches, photo-cells etc fitted. And of course we supply environmentally friendly and cost effective lube free systems. To illustrate our abilities in 1986 we installed all the conveyors and controls for an 66,000 cans per hour fillingline and in 1983 all the conveyors and controls for a 60,000 bottles per hour glass filling line – since then we have increased our capability! We also have continuous motion and fixed arm type laners. These are used for flasks, square bottles, portion cartons, yoghurt pots, shaped detergent bottles or soft pack laning into conveyor or into a packer. They can also be used to merge different products to form a mixed pack of different products. 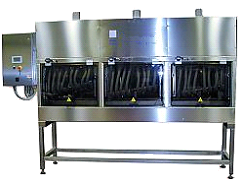 With several hundred drying units in the field with some of the worlds major food and drink companies with speeds from 3,000 – 66,000 container per hour we can solve your drying problems. The conveyor systems are designed around well-proven technology and drawn from 50 years of experience in the conveying field. Conveyor speeds and accumulations are derived from formulae gained from experience in handling returnable glass, non-returnable glass, PET and cans etc. Specials can be manufactured after in depth design study has been carried out.